Airliners.net has a very detailed history on the MD-80. I would like to present to everyone a little history on this fantastic airframe before I present my review. 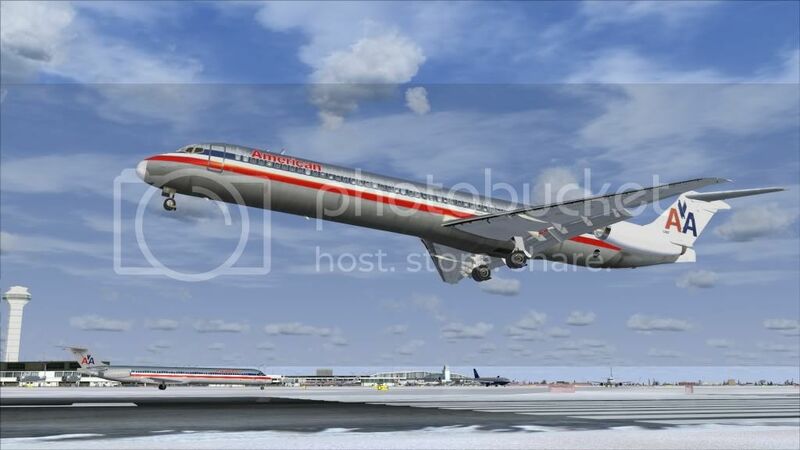 The popular MD-80 series is a stretched and improved development of the McDonnell Douglas DC-9. The origins of the MD-80 lie in 1975 testing where a standard DC-9 was fitted with improved, more efficient, higher bypass ratio JT8D-200 series turbofans. MDC originally proposed fitting the new engines (which meet Stage 3 noise limits) to a development designated the DC-9-55, which would have featured two JT8D-209s and a 3.86m (12ft 8in) stretched fuselage over the 50. Instead MDC developed the DC-9 Super 80 (or DC-9-80), combining the new engines with a further stretched fuselage, increased span wing and other improvements. Launched in October 1977, the Super 80 first flew on October 18 1979. Certification for the initial Super 80 model, the 81, was granted in July 1981. The first customer delivery was to Swissair in September 1980. McDonnell Douglas renamed the DC-9-80 the MD-80 in 1983. The MD-80 designation however is a generic designation for the series and does not apply to a certain model type. The specific MD-80 models are the initial MD-81, the MD-82 with more powerful JT8D-217s, the extended range MD-83 with extra fuel and more efficient JT8D-219s, and the MD-88 (first flight August 1987) with the JT8D-219s of the MD-83 with an EFIS flightdeck and redesigned cabin interior, with other improvements. The shorter fuselage but longer range MD-87 is described separately under McDonnell Douglas. Initial sales of the Super 80 were slow until American Airlines placed an initial order for 67 MD-82s (with options on 100) in early 1984 (American now operates a fleet of 260 MD-80s), kickstarting what went on to become a highly successful program - the 1000th MD-80 was delivered in March 1992. Following the 1997 merger of Boeing and McDonnell Douglas the future of the Douglas airliners were reviewed. In December 1997 Boeing announced its decision to drop the MD-80 and MD-90 once current orders were fulfilled. 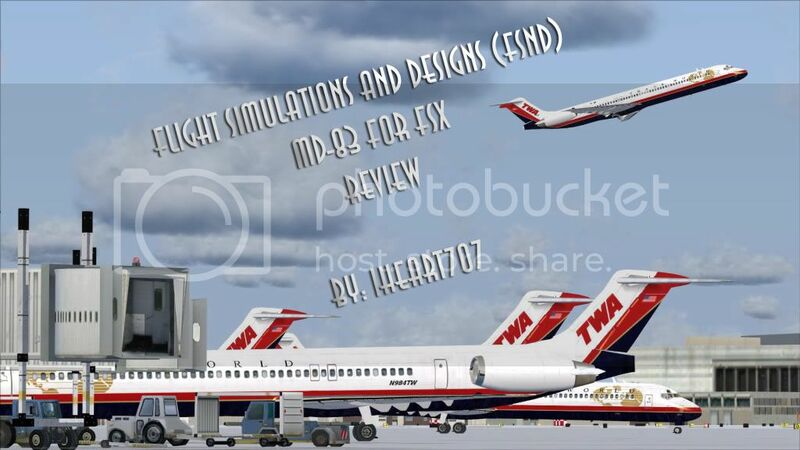 An April 1998 TWA order for 24 MD-83s will see the MD-80 remain in production until January 2000. From the clean wing design, to inclusion of all the antennas, no modeling on this modern fuselage was left undone. Many designs other than doors and windows also make up the exterior model of the MD-83. To jump on board, you might want to open up the air stairs. Used frequently by pilots and civilians alike, functioning set of air stairs built into the rear and front of the plane are a nice perk to have. While we are already looking at the rear of the plane, why don’t we have a look at the engines and tail? After several major advancements in fuel efficiency were made, Pratt and Whitney finally produced the widely known JT8D engine. The engine commonly used on the MD-83 in the later years of operation was the JT8D-200. If you were to compare this to pictures of the real engine, you would find that this style of engine was accurately modeled. I even found that the animation of the reverser found on each engine buckets is accurately done. But I was kind of surprised at the lack of detail and the simple texturing done on the parts on the engine. The detail that should exist on the engine’s parts simply do not exist here, which can be viewed as sort of a letdown. The familiar T – style tail found on the MD-83, is generally the same on every MD-80. Featuring a hydraulic screw built into the tail, this helps to adjust the pitch of the elevator. As every pilot should do, a visual inspection of the position of the tail should be performed before and after every flight. As I will explain in the flying notes, trimming this airplane is very important. Similar to the elevator control, the rudder is also powered by the use of hydraulic actuators. In the simulator, this airplane models the full range of the rudder very accurately. From a closer inspection while in the air, you would be able to see that even while yaw dampener animations are accurate as well, if the pilot so choses to use it. Showing the flaps retracted, then extended. Transitioning to the wing, we are able to see many unique animations built into the plane. For starters, if you were a flier of the Erik Cantou MD-80’s you probably remember having to use the tail hook command to extend the landing lights. Instead of using that key command, FSND took the time to actually build it into the wing itself. When you operate the flaps so the leading edge is extended, you will notice that the wing lights will also fold out automatically for you. On top of having a ton of detail in the lighting of the airplane, nothing can compare to the structure of the wing itself. Looking at all the mechanics under the wings, it becomes very evident that the FSND team really went to a great effort to accurately model this airplane. The struts supporting the leading flaps were all modeled and animated correctly according to the real airplane. The most important set of flaps, the trailing flaps were also modeled very well in my opinion. Fortunately, there is nothing to complain about here! Many animated doors and stairs! One really cool thing about this airplane are the doors. In the FSND MD-83, there are many different options and selections you can use. For “hors d'oeuvre”, the main entry door is very detailed in itself. Without the assistance from a jet way, pilots can use a functional set of stairs which is located underneath the main entry. This convenient addition allows the pilots to operate this airplane from semi-prepared airports that have limited services. If you were to also look by the tail of this airplane, you can find another set of stairs that fold up and into the fuselage itself, as described earlier. Although this really does not count as a doorway, you can get a little fresh air while you taxi by using another door command. I personally would have liked to have been able to simply click on the window to open it, but unfortunately that is not possible at this time. If you so happen to find yourself at an airport that has ground services and cater trucks, this airplane is compatible. Once you shut down the engines, set the parking brake, and finally open up the doors, the service trucks will start to roll towards your plane. You might notice that some of the cars might get a little close to your wing, but don’t worry – they won’t crash your plane and ruin your day! 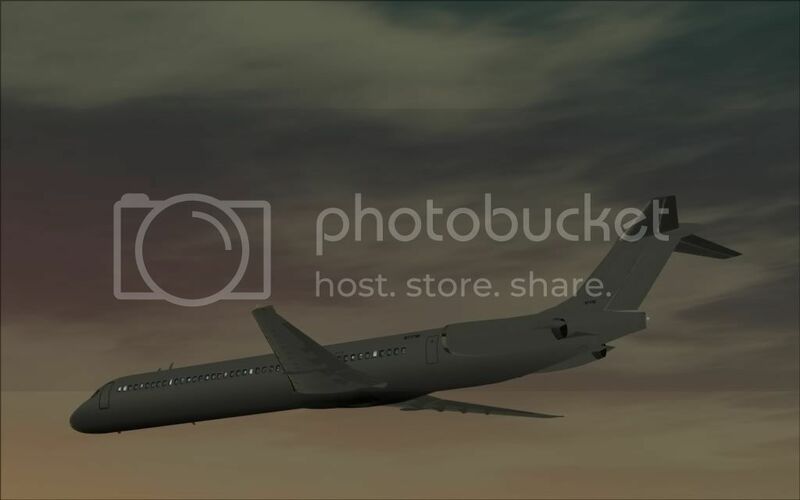 On top of having the cars connect to your plane, you can also expect to have the ability to connect to a jet way and other ground services if need be. One of the nicest things about this airplane is the virtual cockpit. Many unique features exist in this panel that simply does not exist in other freeware aircraft today. Although it does not feature a virtual cabin, it has a very detailed virtual cockpit to make up for it. For starters, there are many usable buttons scattered across the vast cockpit. Almost all of these buttons are modeled correctly and properly function. The overhead in particular works so well, it might have set a new standard for freeware products! Although the overhead panel looks really good, unfortunately it cannot be said about some of the other parts in the cockpit. A simple glance over the MCP and you will find stark contrasts between clear text and blurry objects. Some of the buttons are clear while others are not. The rest of the surrounding cockpit has a few other minor texturing issues as well. From a personal standpoint, I do not like the textures that have been placed on the seat, yolk, and flooring. They seem to be very basic and generic textures when compared to pictures of actual airplane’s interior. It doesn’t seem as if there was a ton of effort placed on the accuracy of these materials. Other than those small issues I found, the rest of the airplane was still really impressive. Gauges similar to those found in the actual airplane were carefully used inside the cabin. Using mainly default gauges from the A321, 737-400, and 737-800 these did not fulfill all the necessary gauges to accurately model the airplane. You will find some new and custom gauges included inside of this airplane like the autopilot, fuel indicator, and other miscellaneous gauges as well. Needless to say, with the cockpit’s issues, it is safe to say that there is a lot of useful eye candy onboard this airplane. Take a gander around before you go on your first flight! 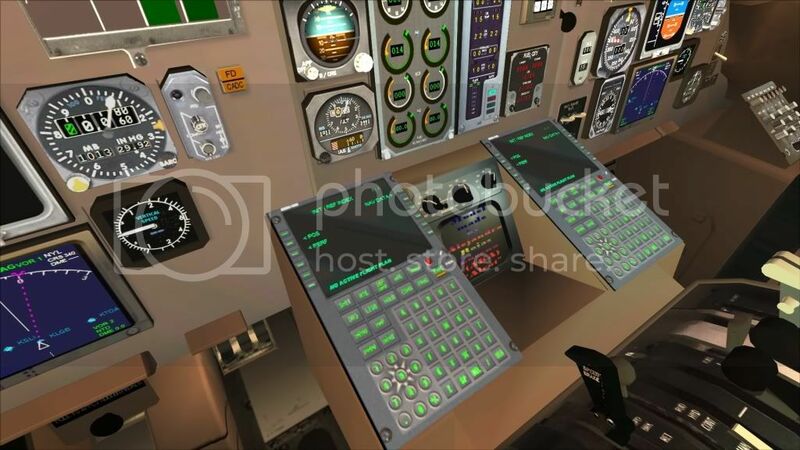 Inside the virtual cockpit, (also available as a 2D pop-up), you will be able to find a nifty piece of hardware that represents and operates like a real Flight Management Computer. Although it does not have all the bells, whistles, and functionality as a payware FMC, it is welcoming of new users and it is very easy to learn. For more documentation on what is included, the main package includes an operation manual that goes into extreme detail about what every button does. I would suggest everyone to look at the manual once; otherwise you might have troubles using it in game. Similar in style to the 737’s MCP, the autopilot functions that are included in this package are not out of the ordinary. Some things might be confusing for pilots because of their different positions around the cockpit. If you find yourself struggling to find a certain button, the manual included with this airplane highlights all the locations and functions for you in picture details. One interesting thing about the MD-80 is the FMA. Reflecting the mode that the autopilot is currently using, the tiny window helps to provide the pilot with a better visual aid rather than a simple glowing button. There are four windows on this announcer. Starting from left to right, the windows indicate the auto throttle, arming for certain control modes, roll control for the airplane, and the last one indicating the pitch and VNAV modes. Unfortunately there is no documentation included with this airplane about the individual modes. Practice with the autopilot system is the only way you will be able to view all the indications that this dynamic and realistic system provides. Otherwise if you like reading, you might be able to search for documentation on the internet as to the individual modes and how they work. Sometimes if your autopilot was left on, the tail’s trim might begin to accidently move to a position where it is unsafe to use in flight. Through personal experience of trial and error, I have found that the airplane needs more than 3 (but not more than 7) degrees of trim when trying to take off. Failure to do so will result in the airplane either not rotating at the proper VR speed, or else the airplane will rotate too soon if too much is used. Depending on your weight and center of gravity, the exact number will change, but don’t take off without looking at this first! Unfortunately there is little to no documentation about how to trim the airplane based upon its weight and center of gravity. Because of this lack of information, I would recommend that you would go on a few test flights at some large airports before it ruins your day! Right off the bat I can tell you that the sound set that is included with this airplane is far from what it this beast actually sounds like. The familiar and very distinctive sounds of the JT8D engine are far removed from this plane. In fact, I realized the familiar sounds to be the same of those that I had the BAC-1-11. Although the shape of the Rolls Royce Spray engine is similar to that of the JT8D, they are completely different engines and are nothing alike. I would recommend for this airplane several free sound sets from AVSIM. Although they are for FS2004, they will still work fine in the FSX environment. Of course, if you want true accuracy and have a little cash to spend, you might want to look into the excellent payware products by Turbine Sound Studios. After 40 hours flying the unmodified MD-83 and through the experience through the years I’ve collected through flying all the Maddogs (both freeware and payware), I can defiantly make some recommendations for improvements. For starters, the thrust produced by the airplane in the simulator is WAY overpowered. Contrary to the real airplane, this airplane produces more than 2,000 lbs of thrust than the most powerful engine that the JT8D ever produced! According to Pratt and Whitney, the JT8D-200 engine was able to produce around 21,700 lbs of thrust when using take-off power. Upon looking in the .CFG file for the airplane, you can edit the value under [TurbineEngineData] to make it right. Without changing anything else, lowering the Static Thrust value from 24,200 to 21,700 will allow the airplane to fly and handle a lot more realistically. While you’re already in the .CFG file for the airplane, you might want to change another value as well. Under the category titled, [autopilot] find the section that states autothrottle_max_rpm = 90. If you change this value from 90 to 95, you will find it a lot easier for the airplane to fly at altitudes above 27,000 feet. This will allow you to have a lot more control of the airplane during climb and much more realism at higher altitudes. After I flew for 70 hours using the new changes, I can honestly state that this simple change will place this freeware airplane at the same level of flying quality as payware airplanes. On top of the minor technicalities with the flying characteristics of the airplane, many issues also exist with the texturing. I would like to see an improved package featuring sharper textures along with fixes to the liveries that were included in this package. Some of these might be really nitpicky little things that many people could care less about, but I thought that I might as well point them out. Overall airframe: Landing gear door should match the same color of the airplane’s fuselage, and not be weird looking with textures not matching. There should also be engine textures when the reversers are deployed, and not a simple colored mesh. American Airlines: The metallic shape is not clear or clean like the airplane actually is. 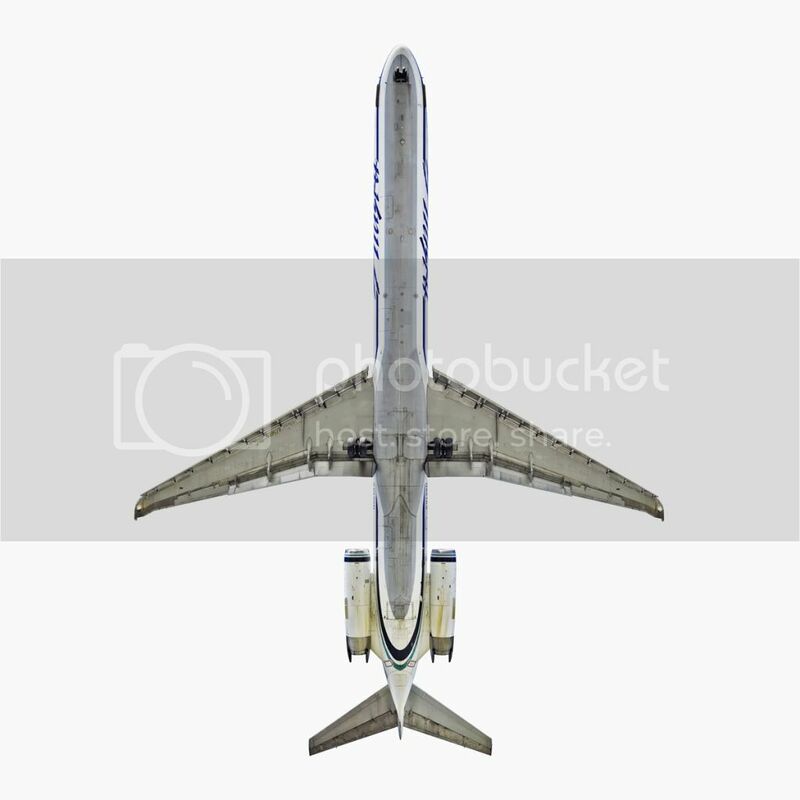 The famous lines that go down the length of the body do not perfectly line up with the different sections of the airplane as well. Alitalia: Weird shapes on the green lines. Places where the line should end and be straight, it has pixilation and deformities. TWA: Names on the front of the airplane are illegible. Engine seams do not line up correctly and look bizarre. CSA: Engine and nose textures do not line up as well as they should. Pixilation and haziness of the lines that wrap around the body are not crystal clear and are generic looking. Iberia: Same issue as with the previous airplanes, the textures do not cleanly line up between the 1/2’s of the airplane. Also, why would there be an MD-88 logo the engine of a MD-83 airplane? Scandinavian: Some of the windows and bump maps that exist on the cabin windows do not line up correctly. Also the textures on the engines does not line up as well as they should. The logo’s on the front are unclear while the logos near the tail are. It is also weird to see some parts cleaner and sharper than others. Allegiant Air: Several big, but simple mistakes happened on this airplane. The biggest mistake was the missing textures on the engines. If you were to look on the inside of the engine (both on the top and bottom) there is a gray mesh where there are no blue engine textures. There is also another mistake with the windows and the alignment of the bump map with the windows on the airplane. It becomes very obvious when the sun is reflecting off of it and the textures are not aligned correctly. Finnair: Same thing as the other textures, the seams of the textures do not align properly on the top and bottom of the airplane. Otherwise, visually I do not see anything else wrong with the airplane. On a final note, one other issue that I noticed was with the fuel indicators. It measures the amount of jet fuel left in each tank in kilograms rather than the US system – lbs. I would have liked to have an option to change this digital display depending upon the countries standard. Overall, this wholesome product is defiantly one to have in your FSX hanger. Although this airplane is plagued with minor texturing issues, I feel that it does not take away from the excellent model. Literally being the only true FSX MD-83 model in existence today, this airplane stands out in a world of few quality freeware add-ons. The airplane flies right, looks right, and is modeled right. If this is your first time in a Maddog, you will easily find that this airplane will be a blast to fly. If you to treat her right, she will defiantly allow for you to fly gracefully through the skies. Take the time to install this airplane and fly a true FSX classic; you won’t regret it!